“Close enough is not good enough. First be the best. Then be first.” At the Centrecom Call Centre, this is not just a wall quote. Kristina Cassar Dowling talks to Robert Spiteri whose mission as general manager is to empower staff with a sense of belonging to accomplish their daily challenges. The wall quote hanging at the Centrecom Call Centre is not there just for decoration. Rather, the words refer to those uttered by co-founder Leslie Anthony Cassar when the company was first set up. There’s strength in knowledge and there’s confidence in knowing how to properly service your clients and their clientele. General manager Robert Spiteri starts off my understanding of his workforce by explaining the industry he services and eagerly maintains. 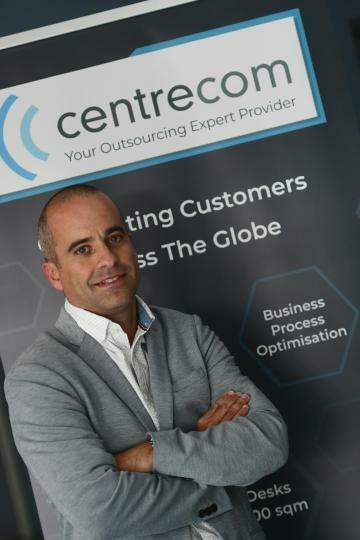 Centrecom is more than a call centre – it is an all-rounded customer support machine which tends to all communication connecting client and customer. Whether it’s voice, e-mail, chat or social connections, Centrecom’s well-structured team adopts a proactive social listening approach – the team covers the full spectrum of communication as well as a social monitoring technique where a reactive on-page method ensures customer experience. With industries that stretch from airline, tourism and travel to government authorities, ecommerce and retail, these local and international sectors are serviced by the hands-on team Spiteri helped build. “Clients are partners to us, no matter the size of their executive board,” he says as he guides me through the methods of operation within the company. “We are communicators who understand the market while creating added value for our clients’ customers. Centrecom’s responsibility is ensuring customer queries are resolved within a stipulated time and as smoothly as possible. This first contact response method requires people power and stirring up positive people power is what this general manager strives for. As the genuine look of pride gleams on Spiteri’s face, his mode of conversation alters, as though he were talking about family. “We understand that without our devoted staff, that now exceeds the 300 headcount, we won’t be able to deliver a premium service,” he continues. Adopting a mentality where employees are considered people and not numbers may be a hard pill to swallow for employers, but Spiteri’s strong belief that his employees are not robots is one that creates a level of comfort and flexibility for his staff. Centrecom runs a tight ship where in-house training helps to develop soft skills for all recruits, new and experienced. Product training procedures run for three to four weeks and culminate with a buddy-training programme where more experienced members of the team help new members in their journey to premium quality. All training is personalised depending on quality tests that are periodically crafted to better the team. These training sessions take place 40 to 60 times per year and evoke a healthier working environment. At the end of the day, Centrecom is a business – one firmly set on recognising growth within the company. Much like the economic growth of the company, individual development is highly recognised with in-house promotions. Climbing the ladder of success at your place of work is something many strive for and knowing your worth is appreciated and recognised within the company is the icing on the cake. The Centrecom family is a mixed one, boasting different ages, marital status, educational status or minority group qualities but also a workforce firmly set on the company’s pillars of success including the more charitable facet of the business. Corporate Social Responsibility is on the tip of every business’ tongue, and of course Centrecom takes on worthy causes by sharing their success with them. The approach though may be different. Team building events initiated by the human resources department carry two vital purposes. The primary aim is to create a healthy environment for optimum interactivity between staff while their secondary purpose is to motivate staff in charitable contributions – creating a we-did-it-together mentality. With a solid foundation to firmly stand on and a clear vision for their fruitful future, Centrecom is looking to broaden horizons for both employees and client bases. In 2019, our plan is technical in terms of moving from a multi-channel to an omni-channel platform, but also in terms of industry growth as we aim to incorporate crypto exchanges and blockchain companies into our portfolio,” Spiteri says.